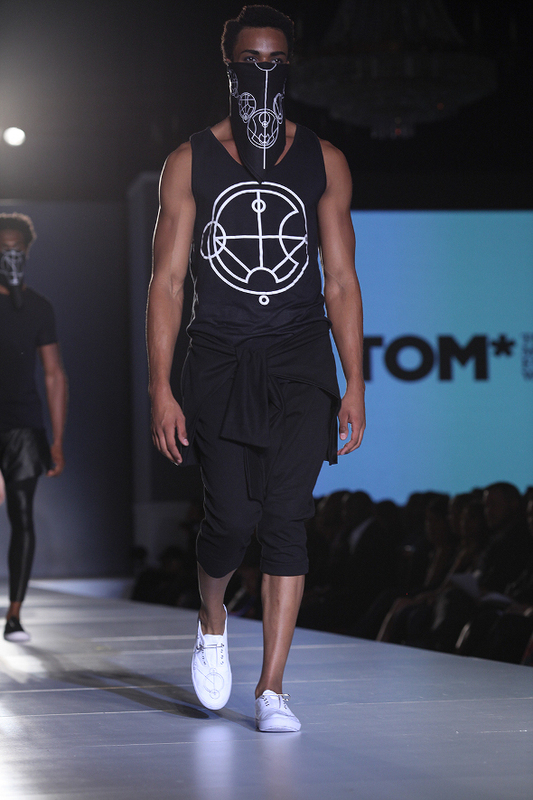 Toronto Men's Fashion Week (TOM) made a debut appearance on the Toronto fashion scene this week. 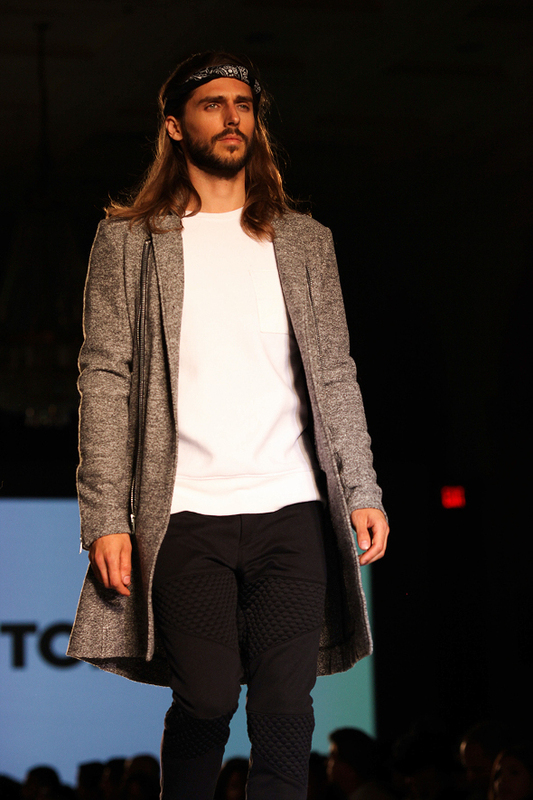 From August 12 to 14, the Fairmont Royal York was swarmed by gents - ranging from dapper to avant-garde on the style spectrum - and other fashion fans looking to take in the collections of up-and-coming menswear designers from around the globe. Here, in no particular order, are 10 of my favourite looks - and five of the wackiest ones - from the first-ever TOM. The common thread in Wigley's collection was feminized athletic influences: teeny-weeny shorts, voluminously-tailored tops with linebacker-like shoulders, and a few Tumblr-appropriate flower crowns. It may be flashy, but if every dude in Toronto started walking around in floral bomber jackets, hot-pink shorts, and Doc Martens tomorrow, I would be thrilled. I'm a sucker for prints, and Paulo Succar's collection of vivid, oversized insect motifs was repeated and remixed over and over throughout his collection. 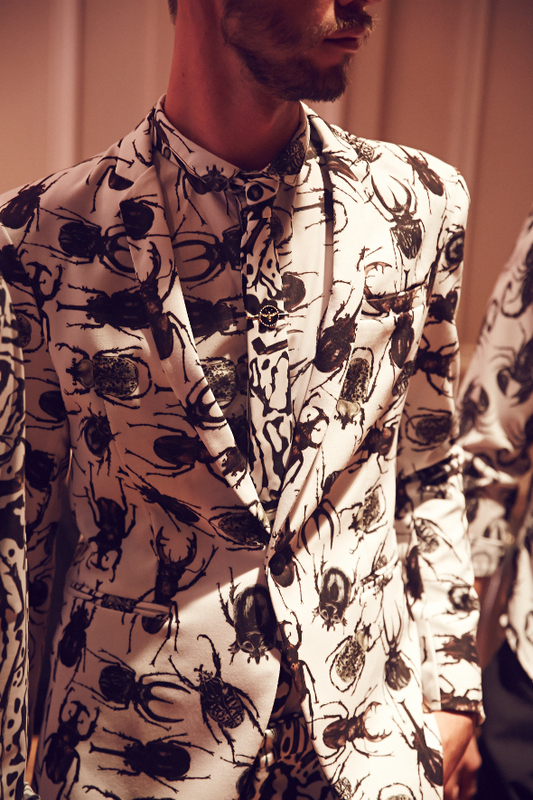 Bug patterns on bug patterns - it's the new monochrome! Toronto-based Sons of Odin delivered a strong show to their hometown crowd - a collection of monochromatic basics beautifully updated with rich texture, pattern (ropes 'n' roses), and leather details. There's nothing flashy about this mid-length tweed jacket, but the tailoring, details and drape are all spot-on - this is a brand doing practical casual menswear right. The week's most contested collection was equal parts feminine and futuristic, with the latter seen in pieces like this sculpted coat. All told, it was one of the week's most out-there shows (hell, the line's name means "the strange man") - but given designer Mic. Carter's stance on exploring gender roles in masculinity, it was also one of the most intriguing. 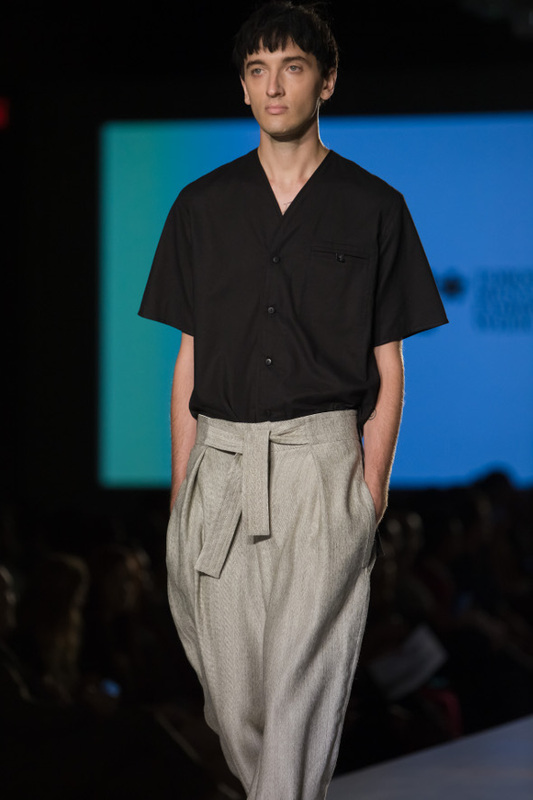 Som Kong was the clear audience fave at the Emerging Menswear Designer Awards, though the top prize went to the still-deserving Joao Paulo Guedes. The texture and layering in Kong's show-ending look (check that subtly shimmering grid in the jacket) made it an undeniable winner, even with the Bane face mask. Poppy pixel prints broke up the clean tailoring and squeaky-clean details in this EMDA finalist's collection - like classic camel trenches and shorts (a major shared thread throughout the collections). Crisostomo did crisp, structured casualwear right, with sharp-edged colour/pattern blocking and unique takes on a classic houndstooth pattern (think tiny cutouts, or black houndstooth shapes stitched onto a white background). The real killer here, though, is this punchy bomber jacket, which would slot nicely into any modern, urban dude's wardrobe. Someone send one of these to Drake or something. The Danish designer (props for calling your line "Christian the boy-king", btw) showed a flowing, minimal line with touches of equestrian and martial artist-reminiscent details (think "Jedi-chic".) 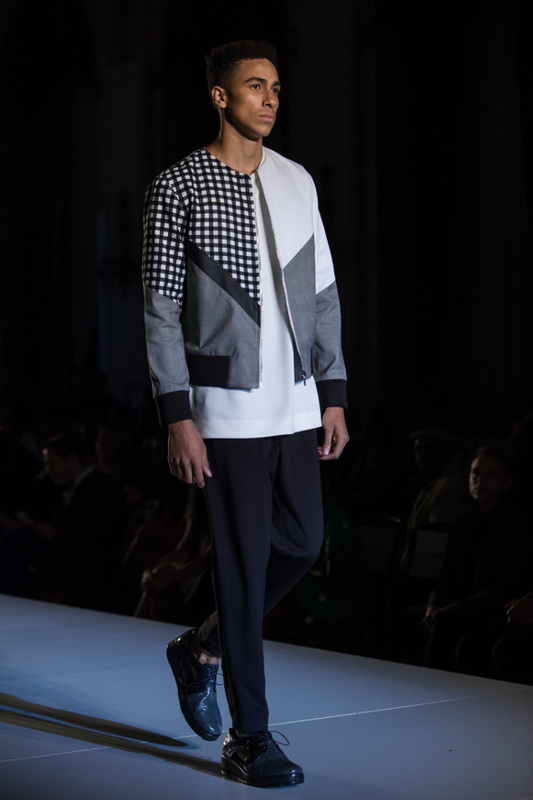 Though the paper-bag silhouette of these pants is unusual in menswear, with a black buttown-down, the challenging silhouette reads as surprisingly wearable and neutral. EMDA finalist Salonga's collection of jersey sportswear separates was marked by a series of graphic designs that may or may not have been a secret message written in Gallifreyan. With coordinating bandannas and shirts sent out on the runway together against basic black pieces, it's a great example of a simple motif done well. Karimi's collection, featuring androgynous, belted tunics with hand-drawn graphics, wasn't wild by TOM standards - it was the models' makeup that put things over the top. Pieces of Scotch tape were placed on each face, with a few of the models' lower lips taped down to create a strange grimace. I will relive the magic of TOM forever as this particular gent's thousand-yard stare makes guest appearances in my nightmares. TOM gave the techies some love this week, with a wearable tech pavilion and a runway show featuring the latest in futuristic fashion. The wackiness factor of this boyshorts-and-headgear look is obvious, but I also want to see a sci-fi movie in which someone wakes up in an isolation chamber wearing this exact outfit. We saw a lot of tighty-whiteys on the TOM runway this week, and Luca Galardo's iridescent, transparent bodysuit was absolutely no exception. 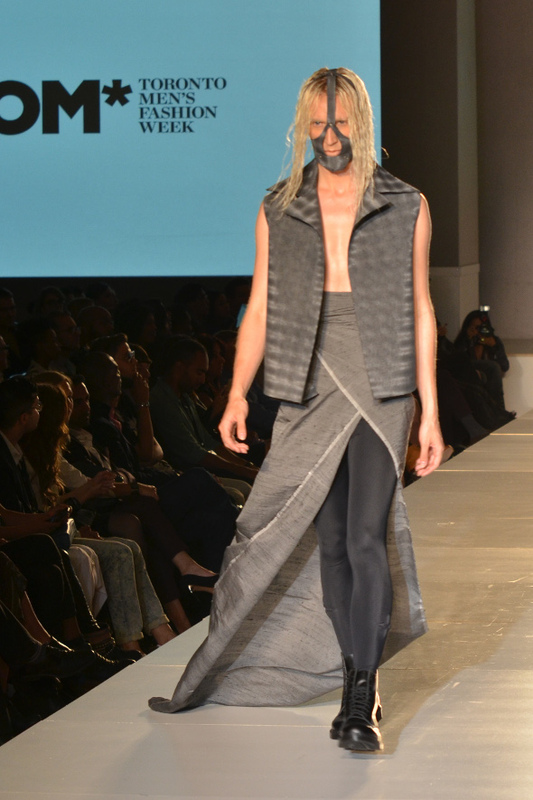 But, in small doses, this futuristic finish was a showstopper - Galardo's athletic, sleeveless tank, made out of the same material, was one of my favourite pieces on the TOM runway. In an oh-so-shocking concept I think may have been plucked from the pilot episode of Ugly Betty, Montreal designer Benjamin Lafaille showed a collection inspired by car crashes, complete with fake road rash makeup. Easy there, David Cronenberg. Playing with proportion and tailoring is key in a fashion collection - but I found myself just wanting to tuck in guy's shirt for him. Is it just me? Anyone? Bueller? Photos 1, 6, 15 by Arthur von Tyrpa. Photos 2, 5, 8, 11, 14 by Shayne Gray. Photos 3, 12 by Paolo Musa. Photos 4, 9, 10, 13 by Constantine Digovets. Photo 6 by Jowel Villa. All photos courtesy TOM.